Old Huntin' Buddies / J. Jonah Jameson! I Name Thee Murderer! "Old Huntin' Buddies" - The Punisher is on the trail of gamma irradiated MGH, a super drug Moses Magnum is selling on the black market. Spider-Man spots him, and tags along to keep the body count down to a minimum. "J. Jonah Jameson! I Name Thee Murderer!" 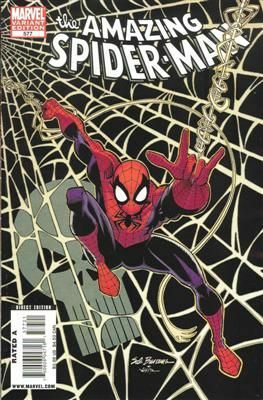 - In this brief interlude, the Bookie has deduced that the Spider Tracer Killer must be someone with a sense of justice (for killing only criminals), a lot of funding (to accurately reproduce the tracers) and a grudge against Spider-Man. He leads himself to one inevitable conclusion: J. Jonah Jameson.